A signal may be carried by an AM or FM radio wave. 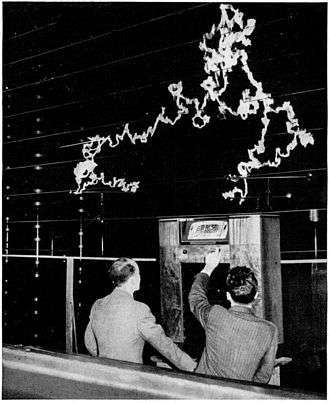 FM has better noise (RFI) rejection than AM, as shown in this dramatic New York publicity demonstration by General Electric in 1940. The radio has both AM and FM receivers. With a million volt arc as a source of interference behind it, the AM receiver produced only a roar of static, while the FM receiver clearly reproduced a music program from Armstrong's experimental FM transmitter W2XMN in New Jersey. In telecommunications and signal processing, frequency modulation (FM) is the encoding of information in a carrier wave by varying the instantaneous frequency of the wave. This contrasts with amplitude modulation, in which the amplitude of the carrier wave varies, while the frequency remains constant. In analog frequency modulation, such as FM radio broadcasting of an audio signal representing voice or music, the instantaneous frequency deviation, the difference between the frequency of the carrier and its center frequency, is proportional to the modulating signal. Digital data can be encoded and transmitted via FM by shifting the carrier's frequency among a predefined set of frequencies representing digits - for example one frequency can represent a binary 1 and a second can represent binary 0. This modulation technique is known as frequency-shift keying (FSK). FSK is widely used in modems and fax modems, and can also be used to send Morse code. Radioteletype also uses FSK. Frequency modulation is widely used for FM radio broadcasting. It is also used in telemetry, radar, seismic prospecting, and monitoring newborns for seizures via EEG, two-way radio systems, music synthesis, magnetic tape-recording systems and some video-transmission systems. In radio transmission, an advantage of frequency modulation is that it has a larger signal-to-noise ratio and therefore rejects radio frequency interference better than an equal power amplitude modulation (AM) signal. For this reason, most music is broadcast over FM radio. Frequency modulation has a close relationship with phase modulation; phase modulation is often used as an intermediate step to achieve frequency modulation. Mathematically both of these are considered a special case of quadrature amplitude modulation (QAM). where = , being the sensitivity of the frequency modulator and being the amplitude of the modulating signal or baseband signal. While most of the energy of the signal is contained within fc ± fΔ, it can be shown by Fourier analysis that a wider range of frequencies is required to precisely represent an FM signal. The frequency spectrum of an actual FM signal has components extending infinitely, although their amplitude decreases and higher-order components are often neglected in practical design problems. where the amplitude of the modulating sinusoid is represented by the peak deviation (see frequency deviation). The harmonic distribution of a sine wave carrier modulated by such a sinusoidal signal can be represented with Bessel functions; this provides the basis for a mathematical understanding of frequency modulation in the frequency domain. where is the highest frequency component present in the modulating signal xm(t), and is the peak frequency-deviation—i.e. the maximum deviation of the instantaneous frequency from the carrier frequency. For a sine wave modulation, the modulation index is seen to be the ratio of the peak frequency deviation of the carrier wave to the frequency of the modulating sine wave. If , the modulation is called narrowband FM, and its bandwidth is approximately . Sometimes modulation index h<0.3 rad is considered as Narrowband FM otherwise Wideband FM. where is the symbol period, and is used as the highest frequency of the modulating binary waveform by convention, even though it would be more accurate to say it is the highest fundamental of the modulating binary waveform. In the case of digital modulation, the carrier is never transmitted. Rather, one of two frequencies is transmitted, either or , depending on the binary state 0 or 1 of the modulation signal. If , the modulation is called wideband FM and its bandwidth is approximately . While wideband FM uses more bandwidth, it can improve the signal-to-noise ratio significantly; for example, doubling the value of , while keeping constant, results in an eight-fold improvement in the signal-to-noise ratio. (Compare this with Chirp spread spectrum, which uses extremely wide frequency deviations to achieve processing gains comparable to traditional, better-known spread-spectrum modes). With a tone-modulated FM wave, if the modulation frequency is held constant and the modulation index is increased, the (non-negligible) bandwidth of the FM signal increases but the spacing between spectra remains the same; some spectral components decrease in strength as others increase. If the frequency deviation is held constant and the modulation frequency increased, the spacing between spectra increases. Frequency modulation can be classified as narrowband if the change in the carrier frequency is about the same as the signal frequency, or as wideband if the change in the carrier frequency is much higher (modulation index >1) than the signal frequency. For example, narrowband FM is used for two way radio systems such as Family Radio Service, in which the carrier is allowed to deviate only 2.5 kHz above and below the center frequency with speech signals of no more than 3.5 kHz bandwidth. Wideband FM is used for FM broadcasting, in which music and speech are transmitted with up to 75 kHz deviation from the center frequency and carry audio with up to a 20-kHz bandwidth. For the case of a carrier modulated by a single sine wave, the resulting frequency spectrum can be calculated using Bessel functions of the first kind, as a function of the sideband number and the modulation index. The carrier and sideband amplitudes are illustrated for different modulation indices of FM signals. For particular values of the modulation index, the carrier amplitude becomes zero and all the signal power is in the sidebands. Since the sidebands are on both sides of the carrier, their count is doubled, and then multiplied by the modulating frequency to find the bandwidth. For example, 3 kHz deviation modulated by a 2.2 kHz audio tone produces a modulation index of 1.36. Suppose that we limit ourselves to only those sidebands that have a relative amplitude of at least 0.01. Then, examining the chart shows this modulation index will produce three sidebands. These three sidebands, when doubled, gives us (6 * 2.2 kHz) or a 13.2 kHz required bandwidth. where , as defined above, is the peak deviation of the instantaneous frequency from the center carrier frequency ,β is the Modulation index which is the ratio of frequency deviation to highest frequency in the modulating signal and is the highest frequency in the modulating signal. Condition for application of Carson's rule is only sinusoidal signals. where W is the highest frequency in the modulating signal but non-sinusoidal in nature and D is the Deviation ratio which the ratio of frequency deviation to highest frequency of modulating non-sinusoidal signal. A major advantage of FM in a communications circuit, compared for example with AM, is the possibility of improved Signal-to-noise ratio (SNR). Compared with an optimum AM scheme, FM typically has poorer SNR below a certain signal level called the noise threshold, but above a higher level – the full improvement or full quieting threshold – the SNR is much improved over AM. The improvement depends on modulation level and deviation. For typical voice communications channels, improvements are typically 5-15 dB. FM broadcasting using wider deviation can achieve even greater improvements. Additional techniques, such as pre-emphasis of higher audio frequencies with corresponding de-emphasis in the receiver, are generally used to improve overall SNR in FM circuits. Since FM signals have constant amplitude, FM receivers normally have limiters that remove AM noise, further improving SNR. For indirect FM modulation, the message signal is integrated to generate a phase-modulated signal. This is used to modulate a crystal-controlled oscillator, and the result is passed through a frequency multiplier to give an FM signal. In this modulation narrowband FM is generated leading to wideband FM later and hence the modulation is known as Indirect FM modulation. Many FM detector circuits exist. A common method for recovering the information signal is through a Foster-Seeley discriminator. A phase-locked loop can be used as an FM demodulator. Slope detection demodulates an FM signal by using a tuned circuit which has its resonant frequency slightly offset from the carrier. As the frequency rises and falls the tuned circuit provides a changing amplitude of response, converting FM to AM. AM receivers may detect some FM transmissions by this means, although it does not provide an efficient means of detection for FM broadcasts. FM is also used at intermediate frequencies by analog VCR systems (including VHS) to record the luminance (black and white) portions of the video signal. Commonly, the chrominance component is recorded as a conventional AM signal, using the higher-frequency FM signal as bias. FM is the only feasible method of recording the luminance ("black and white") component of video to (and retrieving video from) magnetic tape without distortion; video signals have a large range of frequency components – from a few hertz to several megahertz, too wide for equalizers to work with due to electronic noise below −60 dB. FM also keeps the tape at saturation level, acting as a form of noise reduction; a limiter can mask variations in playback output, and the FM capture effect removes print-through and pre-echo. A continuous pilot-tone, if added to the signal – as was done on V2000 and many Hi-band formats – can keep mechanical jitter under control and assist timebase correction. 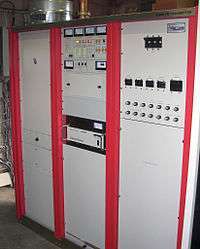 These FM systems are unusual, in that they have a ratio of carrier to maximum modulation frequency of less than two; contrast this with FM audio broadcasting, where the ratio is around 10,000. Consider, for example, a 6-MHz carrier modulated at a 3.5-MHz rate; by Bessel analysis, the first sidebands are on 9.5 and 2.5 MHz and the second sidebands are on 13 MHz and −1 MHz. The result is a reversed-phase sideband on +1 MHz; on demodulation, this results in unwanted output at 6−1 = 5 MHz. The system must be designed so that this unwanted output is reduced to an acceptable level. FM is also used at audio frequencies to synthesize sound. This technique, known as FM synthesis, was popularized by early digital synthesizers and became a standard feature in several generations of personal computer sound cards. Edwin Howard Armstrong (1890–1954) was an American electrical engineer who invented wideband frequency modulation (FM) radio. He patented the regenerative circuit in 1914, the superheterodyne receiver in 1918 and the super-regenerative circuit in 1922. Armstrong presented his paper, "A Method of Reducing Disturbances in Radio Signaling by a System of Frequency Modulation", (which first described FM radio) before the New York section of the Institute of Radio Engineers on November 6, 1935. The paper was published in 1936. As the name implies, wideband FM (WFM) requires a wider signal bandwidth than amplitude modulation by an equivalent modulating signal; this also makes the signal more robust against noise and interference. Frequency modulation is also more robust against signal-amplitude-fading phenomena. As a result, FM was chosen as the modulation standard for high frequency, high fidelity radio transmission, hence the term "FM radio" (although for many years the BBC called it "VHF radio" because commercial FM broadcasting uses part of the VHF band—the FM broadcast band). FM receivers employ a special detector for FM signals and exhibit a phenomenon known as the capture effect, in which the tuner "captures" the stronger of two stations on the same frequency while rejecting the other (compare this with a similar situation on an AM receiver, where both stations can be heard simultaneously). However, frequency drift or a lack of selectivity may cause one station to be overtaken by another on an adjacent channel. Frequency drift was a problem in early (or inexpensive) receivers; inadequate selectivity may affect any tuner. An FM signal can also be used to carry a stereo signal; this is done with multiplexing and demultiplexing before and after the FM process. The FM modulation and demodulation process is identical in stereo and monaural processes. A high-efficiency radio-frequency switching amplifier can be used to transmit FM signals (and other constant-amplitude signals). For a given signal strength (measured at the receiver antenna), switching amplifiers use less battery power and typically cost less than a linear amplifier. This gives FM another advantage over other modulation methods requiring linear amplifiers, such as AM and QAM. FM is commonly used at VHF radio frequencies for high-fidelity broadcasts of music and speech. Analog TV sound is also broadcast using FM. Narrowband FM is used for voice communications in commercial and amateur radio settings. In broadcast services, where audio fidelity is important, wideband FM is generally used. In two-way radio, narrowband FM (NBFM) is used to conserve bandwidth for land mobile, marine mobile and other radio services. ↑ Stan Gibilisco (2002). Teach yourself electricity and electronics. McGraw-Hill Professional. p. 477. ISBN 978-0-07-137730-0. ↑ David B. Rutledge (1999). The Electronics of Radio. Cambridge University Press. p. 310. ISBN 978-0-521-64645-1. ↑ H. P. Westman, ed. (1970). Reference Data for Radio Engineers (Fifth ed.). Howard W. Sams & Co. p. 21-11. ↑ Alan Bloom (2010). "Chapter 8. Modulation". In H. Ward Silver and Mark J. Wilson (Eds). The ARRL Handbook for Radio Communications. American Radio Relay League. p. 8.7. ISBN 978-0-87259-146-2. ↑ A. Michael Noll (2001). Principles of modern communications technology. Artech House. p. 104. ISBN 978-1-58053-284-6. ↑ Armstrong, E. H. (May 1936). "A Method of Reducing Disturbances in Radio Signaling by a System of Frequency Modulation". Proceedings of the IRE. IRE. 24 (5): 689–740. doi:10.1109/JRPROC.1936.227383. Frequency modulation tutorial video with example waveforms and FM transmitter circuit. Gary L. Frost. Early FM Radio: Incremental Technology in Twentieth-Century America. Baltimore: Johns Hopkins University Press, 2010. ISBN 0-8018-9440-9, ISBN 978-0-8018-9440-4.